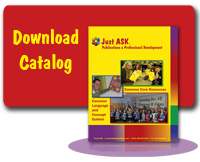 Contact Just ASK directly for quantity discounts for school and district-wide use. Call 800-940-5434 or email quantitydiscounts@justaskpublications.com. Paula Rutherford and several Just ASK consultants pooled their experience and expertise to write Creating a Culture for Learning: Your Guide to PLCs and More. Just ASK consultants contributing to the book include Theresa West, a highly successful principal who turned around two schools within a five-year period, Sherri-Stephens-Carter, a former executive director of assessment and evaluation, Julie McVicker, who has experience directing Title I programs and supervising underperforming schools, Bruce Oliver, a sixteen-year middle school principal and author of the e-newsletter Just for the ASKing!, Brenda Kaylor, a highly acclaimed professional developer and change agent, and Heather Clayton, author of the Just ASK e-newsletter Making the Standards Come Alive! and current principal of a high-performing elementary school. What are the characteristics of cultures for learning? What structures promote and support cultures for learning? What knowledge, skills, and attitudes are needed to create, implement, and maintain cultures for learning? How can schools best use data to inform practice? What is best practice in teaching, learning, and leading in such a school?